The Evan picture light cylinders rotate 90° to direct light projection. Integral, full range dimmer switch regulates illumination level. Available for outlet box mounting or furnished with 30" metal cord cover in a matching finish, cord and plug. 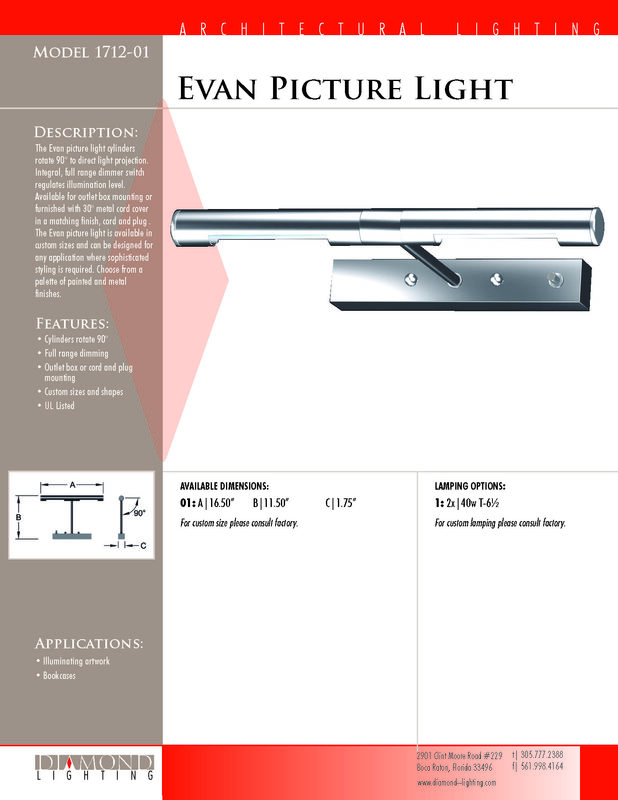 The Evan picture light is available in custom sizes and can be designed for any application where sophisticated styling is required. Choose from a palette of painted and metal finishes. The Provence picture light shade incorporates a ball swivel joint and telescoping horizontal arm to direct light projection. Integral clear reflector focuses light on artwork. Available for outlet box mounting or furnished with 8ft of SPT-2 cord, in-line switch and polarized plug. Twin arm models include a UL listed pre-wired splice box. 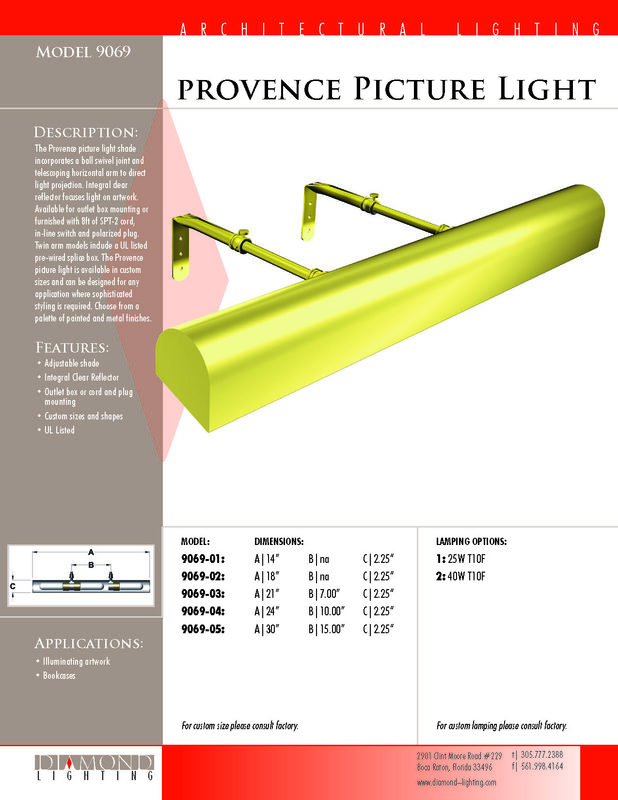 The Provence picture light is available in custom sizes and can be designed for any appication where sophisticated styling is required. Choose from a palette of painted and metal finishes. 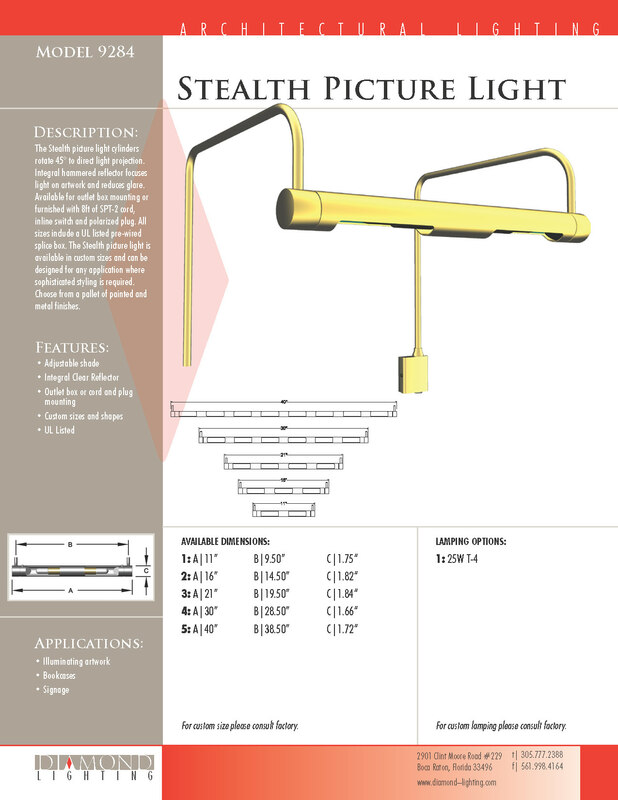 The Stealth picture light's cylinders rotate 45° to direct light projection. Integral hammered reflector focuses light on artwork and reduces glare. Available for outlet box mounting or furnished with 8ft or SPT-2 cord, inline switch and polarized plug. All sizes include a UL listed pre-wired splice box. The Stealth picture light is available in custom sizes and can be designed for any appication where sophisticated styling is required. Choose from a palette of painted and metal finishes.